TANK BADGE - Ariel, Pair of Red Ariel Round Tank Badges with Red background.(1954-59). 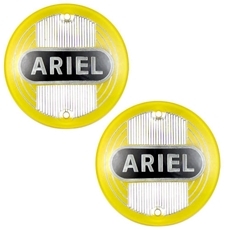 Pair of Red Ariel Round Tank Badges with Red background. TANK BADGE - Ariel, Pair of Yellow Ariel Round plastic tank badges (1954-59). 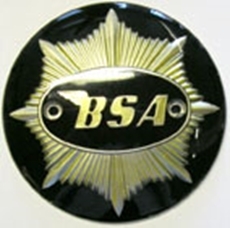 Pair of BSA Round tank badges with GoldStar logo, 4" plastic (1949-58). Black/Gold. Pair of BSA Oil in Frame A65/A70 Metal winged tank badges (1970-72). Single Triumph Tank Badge logo 6" Chrome plated Suitable for Triumph T140, T160 (1978 onwards). Pair of Tank Badges For UK and USA spec Triumph Bonneville T120/TR6 tanks (1967-79) and USA spec T140 models. Die Cast And Enamelled Cream/Black. Ready To Fit with mounting bolts. Right and Left hand.